What fascinates me about the pomerium is that its course in between the stones was never very clearly signalled within the urban landscape, for all the sacred significance which it supposedly carried. It had to be extrapolated from the positions of the stones themselves, and it would only be obvious when you were crossing it if you made a particular effort to look out for them and keep track of how they related to one another. As a result, there seems to have been quite a bit of confusion about exactly where it ran, even in antiquity. My favourite example of that is Aulus Gellius’s discussion of it, where he first wonders (in the present tense) why the Aventine hill is outside the pomerium, and then suddenly reports that Claudius actually included it within the boundary – something which happened a good century before he was writing. Gellius had lived in Rome, so ought to have known where the pomerium ran in real life, but it’s pretty obvious from this passage that he doesn’t. Rather, to him it is clearly something which you might read about in library archives – not a striking physical presence in the urban landscape. And this is exactly why religious ceremonies involving walks around boundaries have traditionally been so important. 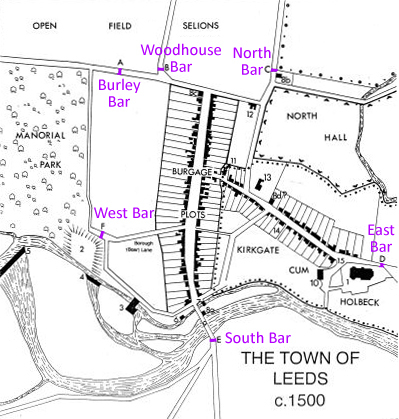 In just the same way, I had no idea about the existence of the Leeds bar-stones until I found out about the Psychogeography walk, so I was very glad of the opportunity to get to know an urban boundary within my own city which had previously been completely invisible to me. 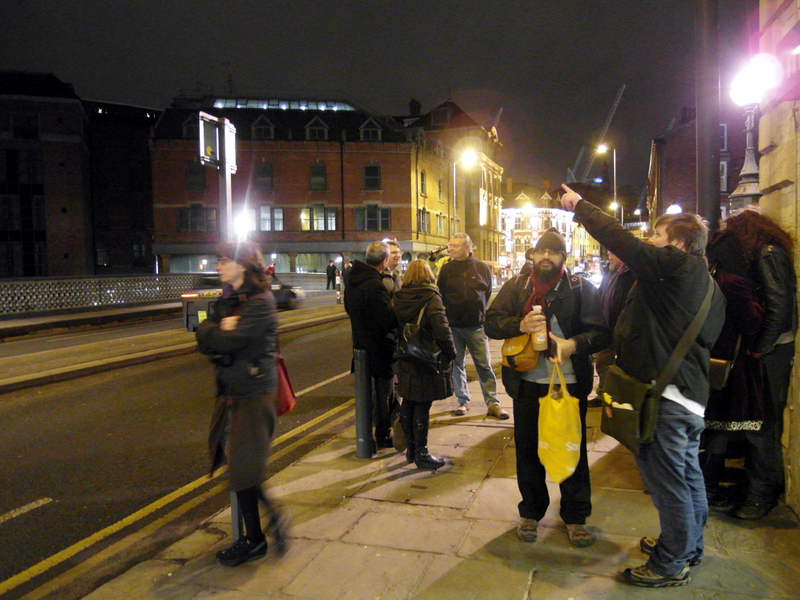 We gathered for our walk in the stunningly appropriately-named North Bar – which isn’t actually on the site of the North bar stone at all. 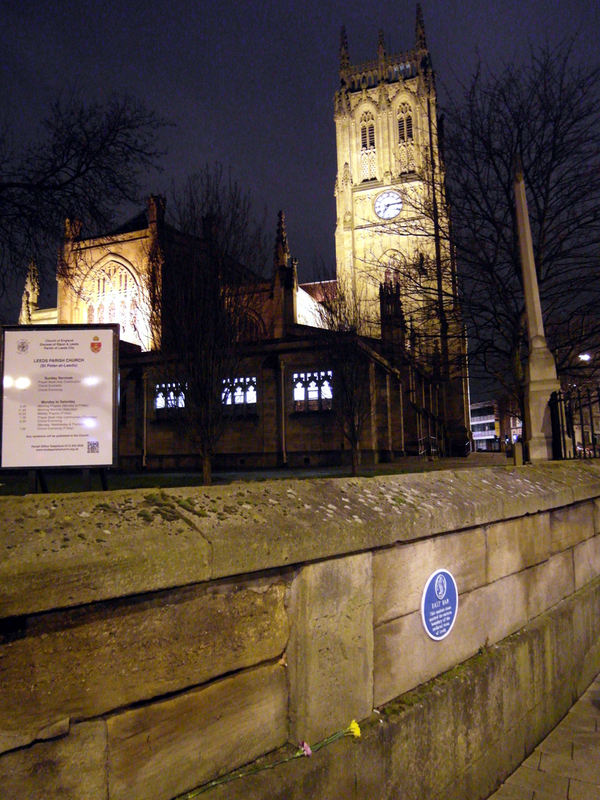 In fact, it is on New Briggate, which didn’t exist at the time the bar stones were first established (see map, above), while the relevant bar stone is on Vicar Lane. 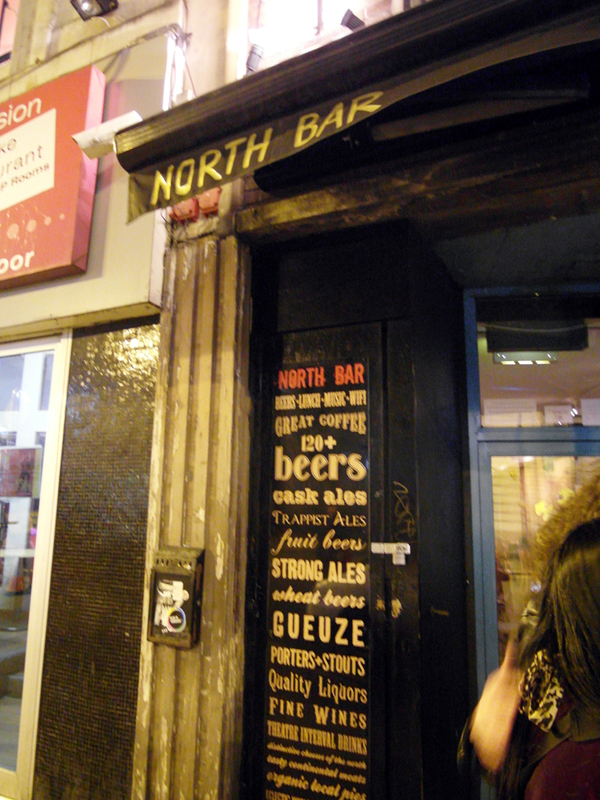 So I guess the name is probably a coincidence – more to do with the fact that the bar is on the north side of Leeds city centre than anything else. 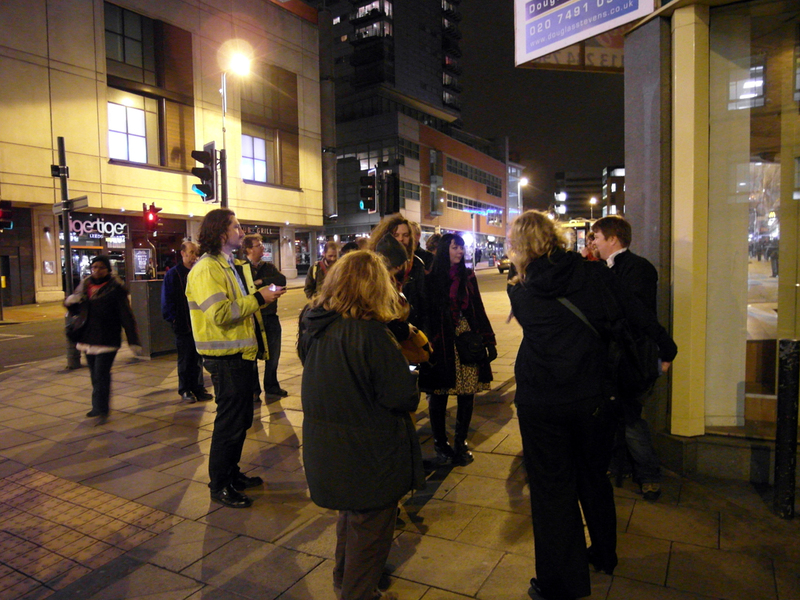 Still, it did seem an auspicious place to find one another and get a quick drink in before setting off. Tim can be see there with his daffodils and his curved augur’s staff (well – he said it was just a stick for guiding crowds of people around and pointing at things, but I liked to think of it as an augur’s staff), telling us about the first stone, and opening a handy bottle of something boozesome for a quick Terminalian toast in its honour. 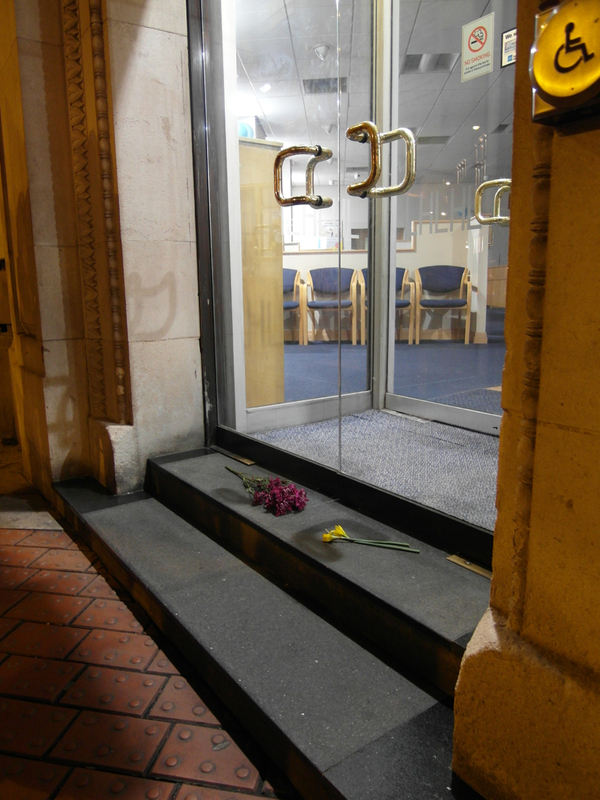 Meanwhile, other people ate ceremonial doughnuts, and I laid some pink carnations on the stone alongside Tim’s yellow daffodils. And so our procession had begun! 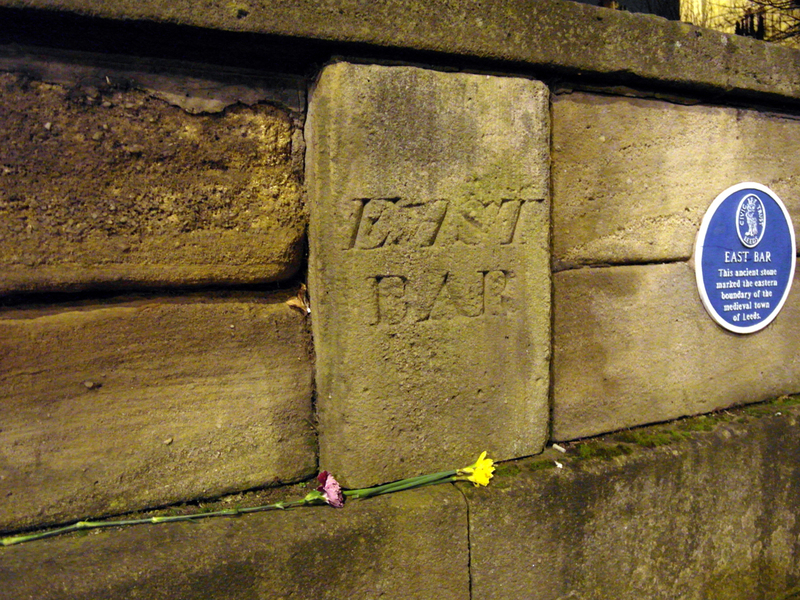 Of all Leeds’ bar stones, though, this was the one whose current state I felt saddest about. 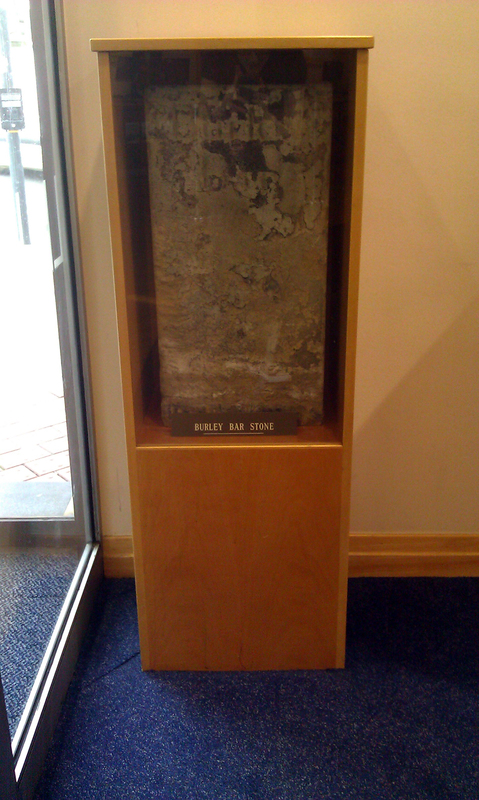 Actually, only two others still exist – the East bar stone and the Burley bar stone (on both of which see more below) – so if the North stone really is lurking behind that wooden board, that in itself is a crying shame. 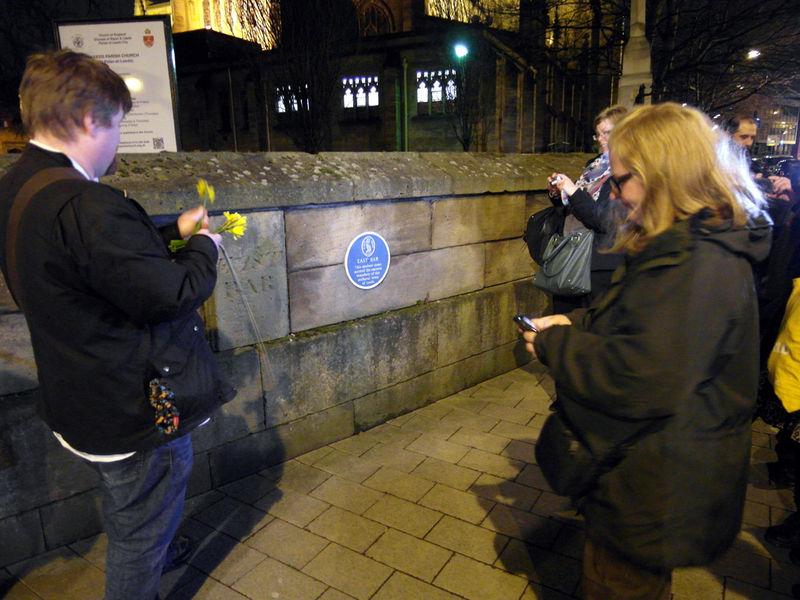 With a very small amount of work, an informative web page, and a few plaques to mark the locations of the lost stones, the Leeds bar stones could serve as a minor tourist attraction for the city – a sort of historical walking route which people might enjoy following as a way of connecting with their city’s history and viewing its current landscape. 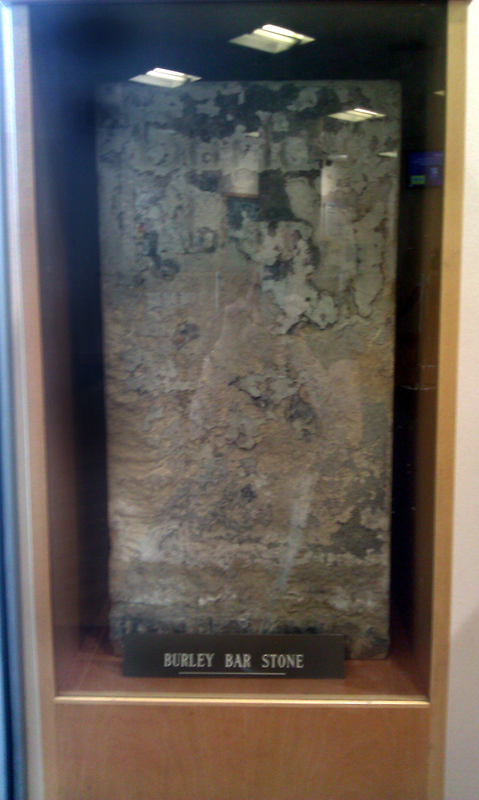 But as it is, the profile of the bar stones is decidedly patchy, and it seems to be only eccentric enthusiasts like the Psychogeographers who take the time to engage with them as a set. 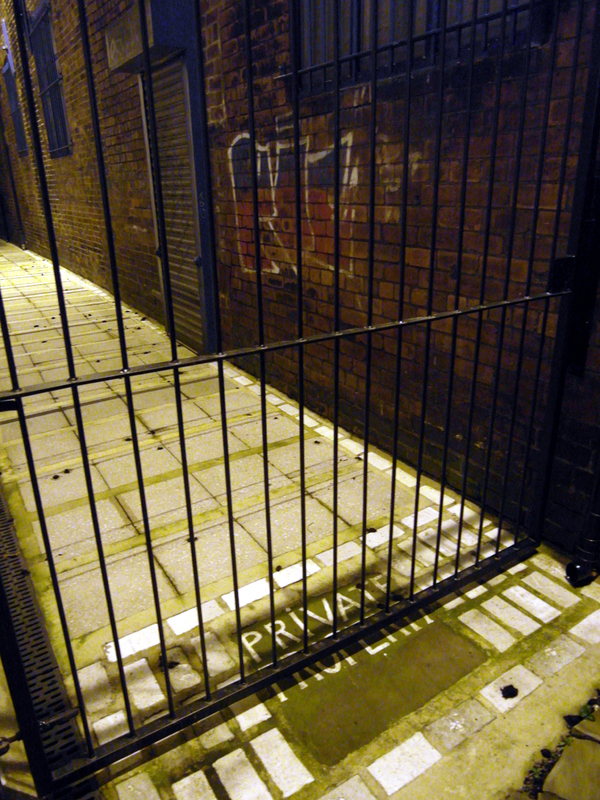 Clearly we have there a completely invisible legal boundary between some private property and the public area we were standing in, which has first been turned into a social boundary by making it visible via a tiled notice in the threshold, but when that (presumably) proved inadequate, reinforced with a physically-impassable barrier. It’s as though it had been placed there especially, just to act as an example of increasingly-insistent boundary demarcation for the purposes of our Psychogeographical musings. 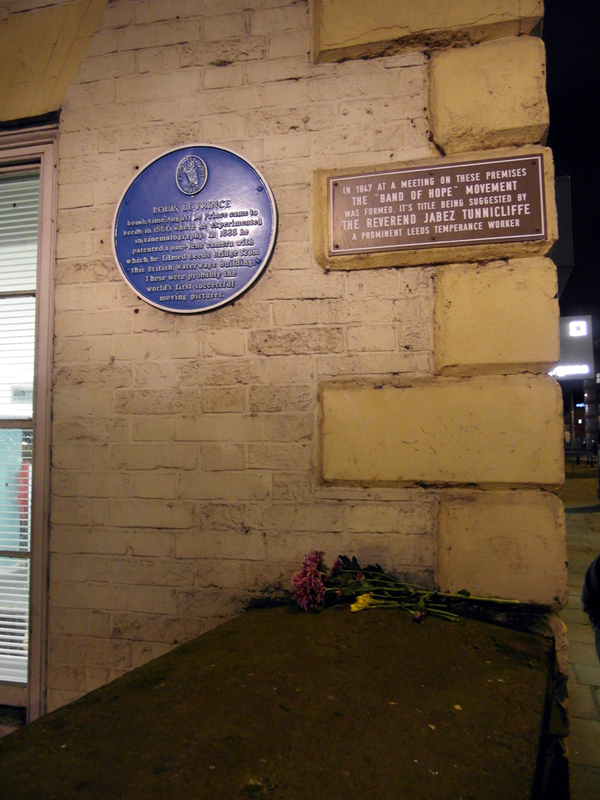 The blue plaque this time marks not the former location of the (possible) bar stone, but the fact that one of the first ever pieces of moving footage, the epic Traffic Crossing Leeds Bridge (1888) was filmed from the window above us. So I suppose we were metaphorically standing on the boundary between the pre-video and post-video ages. 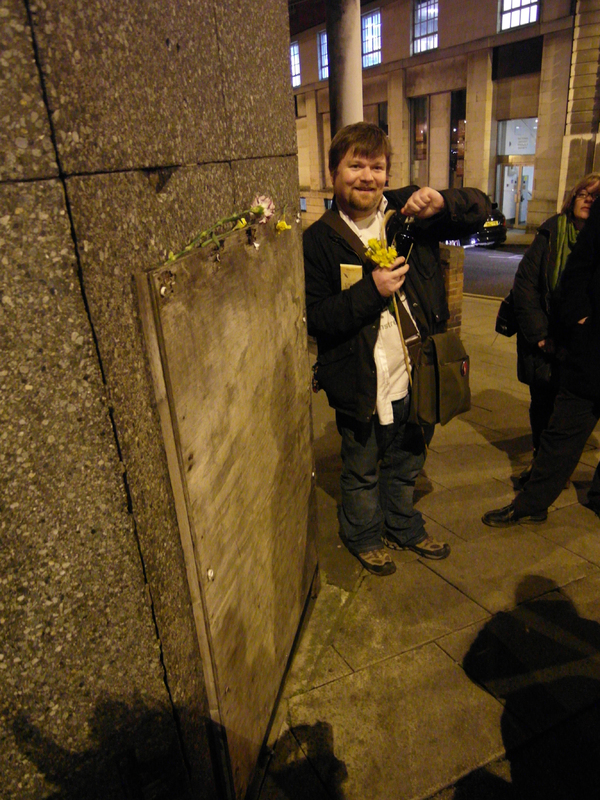 The other plaque marks the formation of the Temperance Movement, Band of Hope, but we chose not to set any limits to our drinking, and continued quaffing away in honour of Terminus. 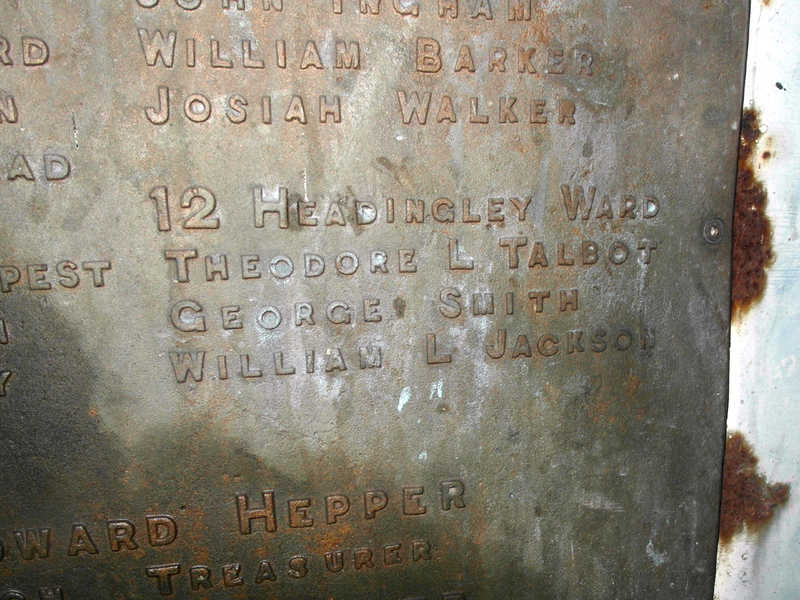 Councillors obviously served three to a ward back then, just as they do now – although I doubt the system was quite the same, or that what was called ‘Headingley ward’ back then had the same limits as it does now. But that’s very much in the nature of boundaries, and particularly political ones. At any given time they represent a consensus view on how to define particular categories or spaces, but the consensus changes regularly, especially where power of any kind is involved. Council ward boundaries, of course, are also usually completely invisible within the immediate urban landscape, but carry immense importance in terms of how the community functions and how power is defined within it. 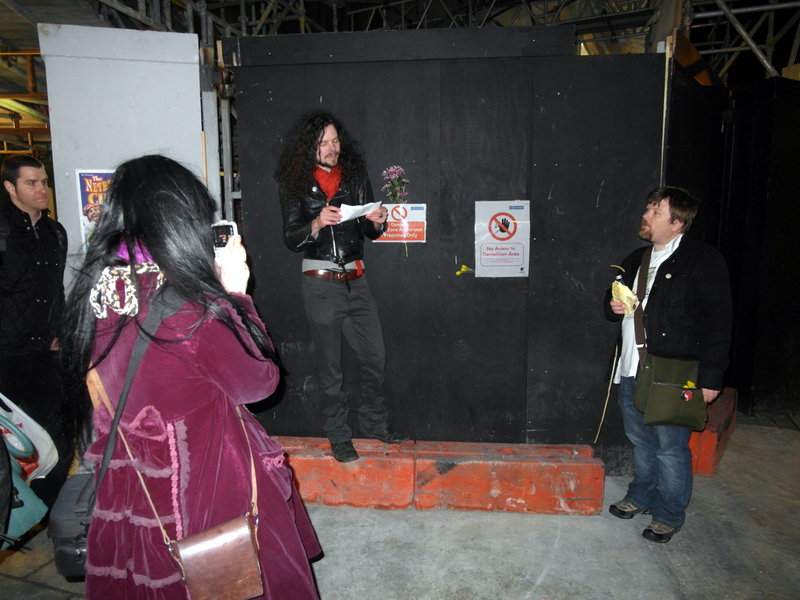 Here, one member of the party read out a poem about the Terminalia, while we laughed wryly at the huge wooden barriers and forceful notices acting as a boundary between us and the boundary we had come to commemorate, and slotted our flowers in behind the notices anyway. 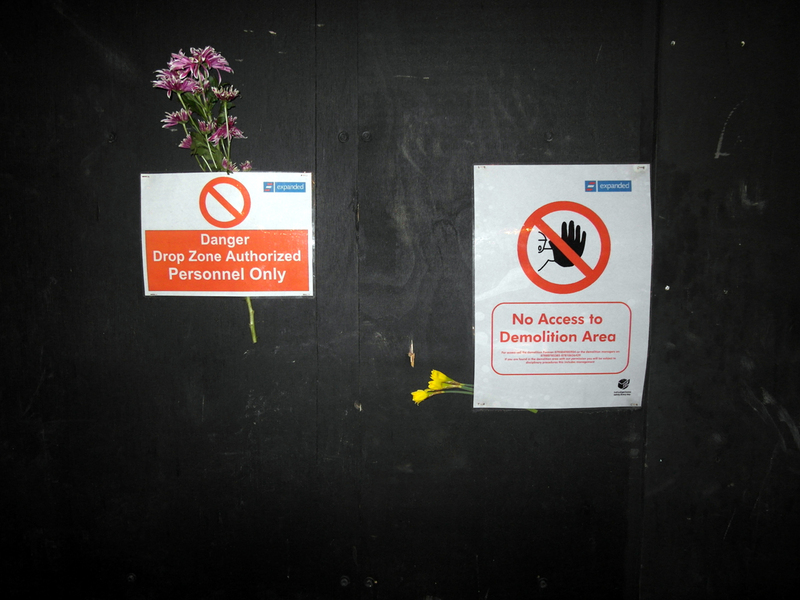 Funnily enough, I came through town a good month after we had done this, and the shrivelled remains of Tim’s daffodils were still dangling from the corner of the notice where he had placed them, though all trace of my pink daises had gone. I suppose it is for the best that it is inside now, as it has clearly seen better days, but a photo posted by a member of the Secret Leeds forums shows it in a prior, outdoor location. 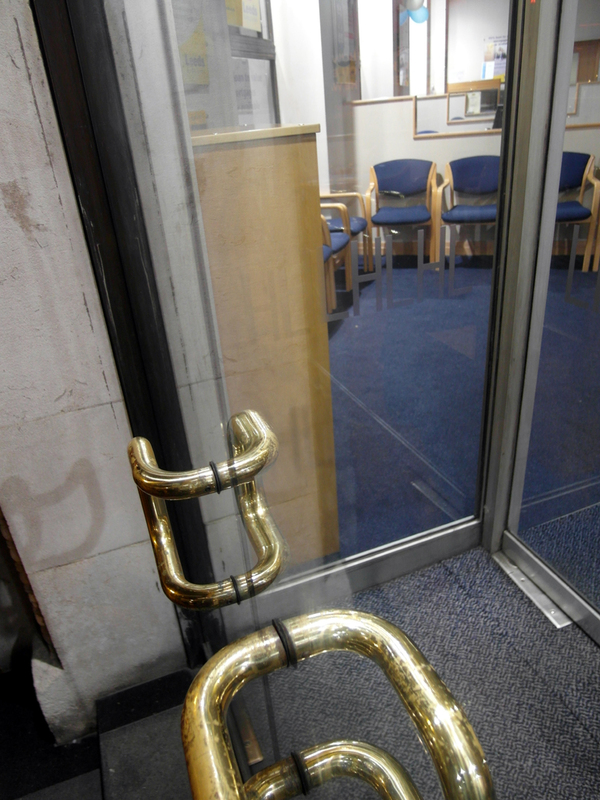 I think it would certainly be nicer to set it up so that it is facing out of the Building Society, rather than into it, so that people can see it at all times, even if it is then protected by a pane of glass. 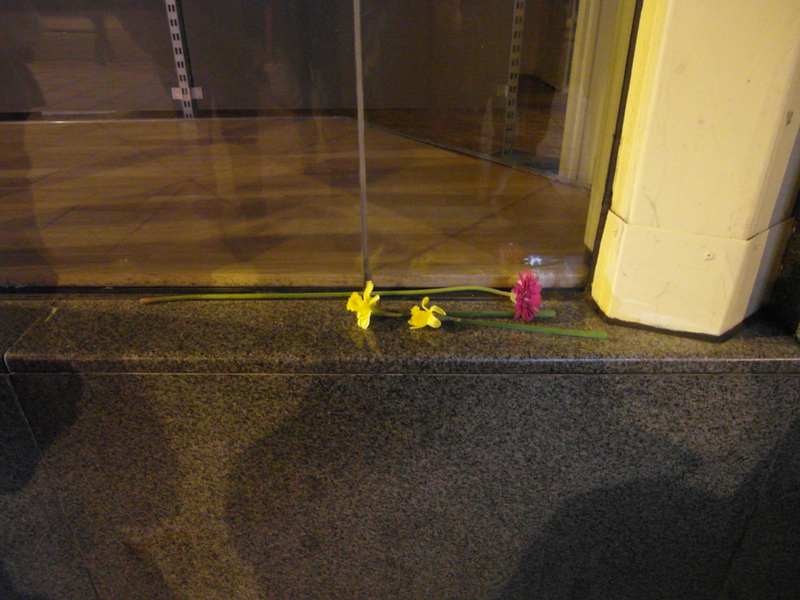 There, our final flowers laid and toasts drunk, we concluded our circuit by repairing once again to the North Bar, for more drinks and some very enjoyable conversation about local politics, various forms of history and the urban landscape. 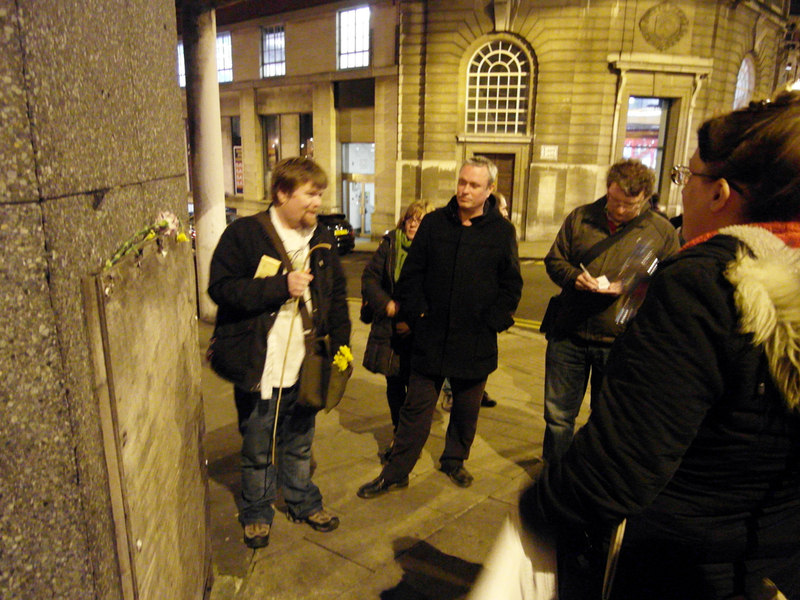 I had enjoyed the night immensely, both for the people I met and for the boundary we celebrated – and, just as ancient boundary ceremonies were designed to achieve, I have found myself ever since very aware of the Leeds bar stone circuit, mentally noting when I cross into or out of it as I move around the city centre. It has added an extra layer to the way I interact with my own city, which I think is exactly what the Psychogeographers were hoping to get out of it, and it has also enhanced my understanding of how people in the Roman era lived with their boundaries – urban and otherwise – too. Indeed, even the fact that we were commemorating an obsolete boundary which barely anyone else cares about seemed appropriately Roman, because that is exactly what the Romans themselves did with the supposed course of Romulus’ original pomerium and boundaries of the ancient city territory, 5-6 miles further out. 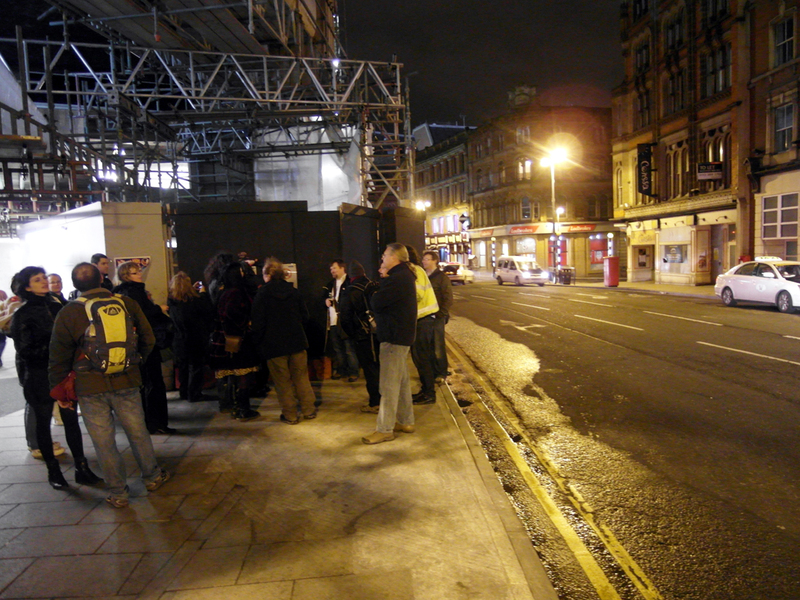 I look forward to being part of the same commemoration again next year. 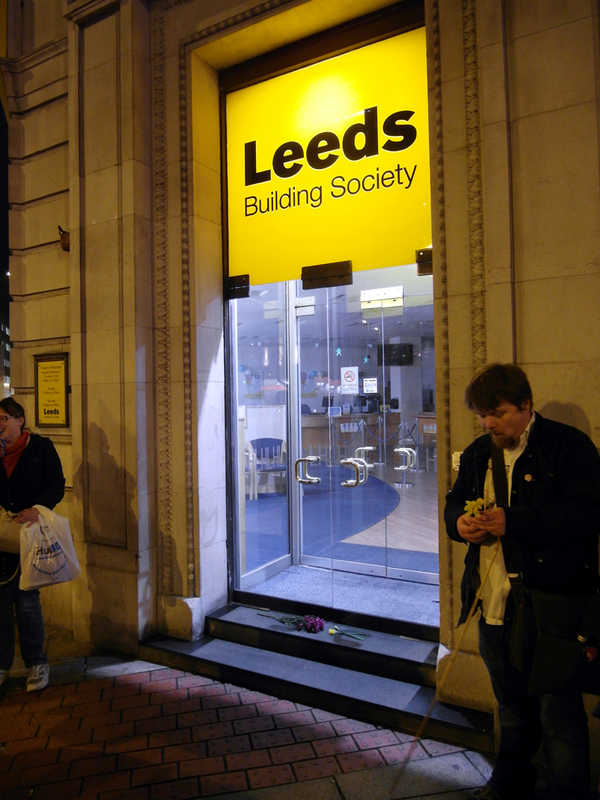 This entry was posted on June 7, 2012 at 10:11	and is filed under classical receptions, history, leeds, roman cities, roman religion, rome, urban geography. You can follow any responses to this entry through the RSS 2.0 feed. You can leave a response, or trackback from your own site. I’m not sure about the North Bar Stone. Did you actually see behing the wooden board? The workman is kneeling down and the North Bar Stone is set into brick. Hi, and thanks for your comment! This is very interesting. No, we couldn’t see behind the board, so I just have Tim’s word that the stone was there – and I don’t know what grounds he had for believing that it was. 1937 does sound about right for the construction of the old bus station, though, as it is distinctly Art Deco in style. So your picture might well help us to solve this if it includes enough detail to figure out where exactly the stone is being cemented in, and particularly whether or not it is part of the bus station. I don’t think you can post pictures in WordPress comments, but if you’d like to email me a copy, I will put up a new post including the picture, and we can talk about it in the comments there. I don’t want to write my email address directly here, because that’s asking for spam, but you can find it on my University profile page. Just to warn you, though, it may be a few days before I have time to make the post, as I’m pretty busy now and about to go away for the weekend too. 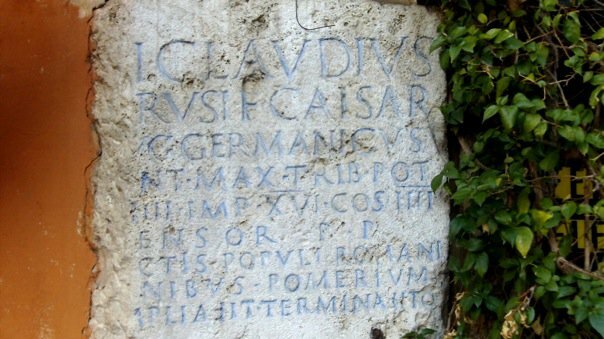 would it be possible if you are the one that took the picture of the Claudian pomerium marker to use it on the wikipedia article (http://en.wikipedia.org/wiki/Pomerium)? We are currently looking for illustrations. Hi Frank, and thanks for your query. I’m afraid I have to confess that that one isn’t my picture, though. I think I just found it by Googling, although I can’t remember where I took it from now. I would guess that if you go to flickr and search for it you will find pictures of it taken by people who are willing to share them on the Wikipedia article, though.